THE IRISH Whale and Dolphin Group has said the Department of Energy is in potential breach of the EU habitats directive for licensing a seismic survey off the Co Mayo coastline without providing adequate protection for marine mammals. The three-dimensional survey is due to start tomorrow on the Corrib field, 65km off the Mayo coastline, and will continue for 100 days, weather permitting. 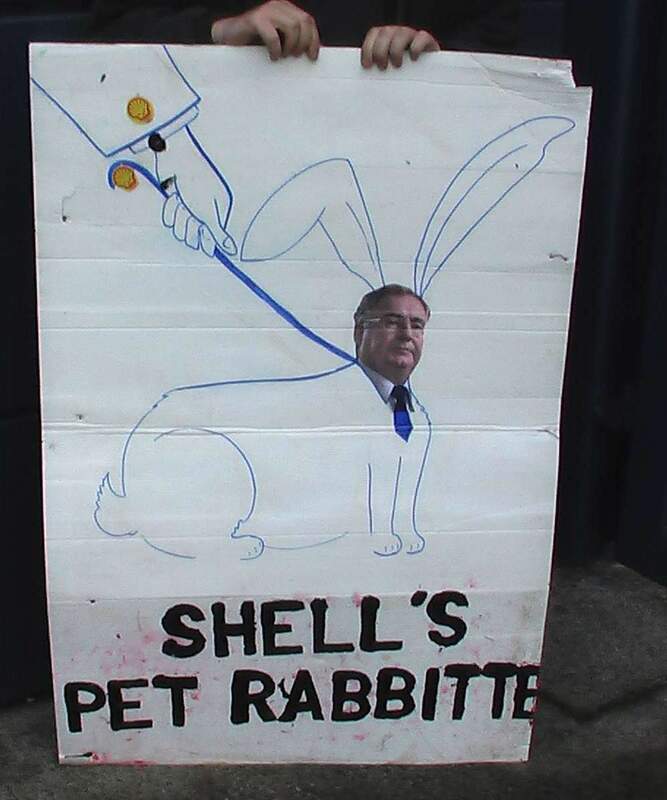 Today, Minister for Energy Pat Rabbitte was confronted by a number of Shell to Sea campaigners outside Croke Park, after he had finished addressing an energy industry conference. The conference was also addressed by Shell Ireland Managing Director Michael Crothers and featured discussion on the future sell off of the State’s energy assets. On leaving the conference Pat Rabbitte was confronted by the campaigners and accused of betraying Ireland’s interests, in particular regarding his decision last October to issue exploration licences for 250,000sq km of the Atlantic shelf, despite an ongoing Oireachtas committee review of oil and gas terms. It’s official. The terms at which we give away rights to potential offshore oil and gas reserves are far too generous. That was the unanimous conclusion of an Oireachtas committee that included 12 TDs and senators from Government parties and nine from the opposition. They want far tougher terms applied to all new licences. By implication, they fault minister Pat Rabbitte for rushing to issue offshore option rights last year covering the most favourable areas off the west coast. The recipient oil companies can convert those options into exploration and production licences that will be subject to the current licensing terms – terms deemed wholly inadequate by the Oireachtas Committee, confirming the long-held view of many commentators. Shell EP Ireland’s managing director Michael Crothers gas paid tribute to predecessor Andy Pyle, who has died unexpectedly. Mr Pyle (64) was appointed by Royal Dutch Shell plc to head the Corrib gas project in 2002, after the company’s €5.7 billion buyout of the original gas field developer, Enterprise Oil. The engineer with 30 years of experience with Shell came to national prominence in June 2005, after his company’s decision to seek a High Court order relating to laying of the Corrib gas onshore pipeline through Rossport in north Mayo. TENSIONS about the controversial Corrib gas project took a new twist recently when security personnel came to blows in a Belmullet hotel in the early hours of the morning of Saturday, May 12 . The two men at the centre of the row have been suspended, by their employer IRMS (Integrated Risk Management Services) pending the outcome of an internal investigation. The Mayo News understands the brawl occurred after the security personnel had spent the night drinking at a local pub and returned to the hotel, where they continued to drink in a bedroom. 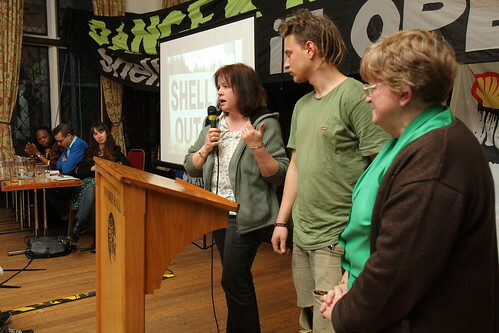 In a new twist to the decade long struggle against Shell Rossport Solidarity Camp has revealed that Mayo County Council (MCC) has issued an eviction notice to the landowner of the field where the Rossport Solidarity Camp is located. Mayo farmer Gerry Burke has been threatened with fines of over €12,000 and two years in prison. Despite these theats the annual June Bank Holiday solidarity gathering will go ahead in a couple of weeks. The camp is taken down each Autumn and re-erected each year in the early summer, this year that was three weeks ago. The Rossport Solidarity Camp is an environmental camp which leaves aslight an ecological footprint as possible, creating their own electricity with wind turbines and solar panels, composting and using grey-water systems to filter and clean up waste water from washing up etc. People come to the camp to see these systems in operation and attend workshops on how to construct similar systems elsewhere. Mayo: A north Mayo farmer who recently offered a camp site to opponents of the Corrib gas project has been issued with an enforcement notice alleging planning breaches by Mayo County Council. Mayo county secretary John Condon confirmed yesterday that the notice had been issued under the Planning and Development Act 2000 as the “first stage” in legal proceedings. If no action was taken, penalties could be imposed by a court, Mr Condon said. Possible penalties range from fines of over €12,000 to two years in prison. received. The Camp has only moved into this field in the last three weeks.